Liverpool-born jockey Franny Norton dedicated his win on favourite The Gold Cheongsam at Doncaster to the victims of the Hillsborough disaster. The rider won by a neck on the 11-4 shot from Hajam in the Weatherbys Insurance £300,000 2-Y-O Stakes. A day after Liverpool fans were cleared of any blame in relation to the 1989 tragedy - in which 96 people died - Norton was close to tears. "That victory isn't for me, it's for the Hillsborough 96," said Norton. The fans died as a result of overcrowding at the start of the FA Cup semi-final between Liverpool and Nottingham Forest on 15 April 1989. 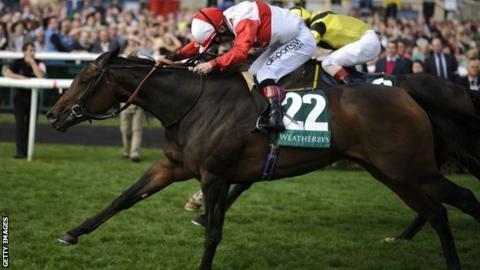 On day two of the St Leger meeting at Doncaster, Sir Henry Cecil's Wild Coco (7-4 favourite) followed up her win at Goodwood with a gutsy success for jockey Tom Queally in the DFS Park Hill Stakes. In a race known as the fillies' St Leger, the Queen's Royal Ascot winner Estimate kicked three lengths clear under Paul Hanagan but faded inside the furlong and finished third behind runner-up Hazel Lavery.